Background: 3,5-Bis[4-(diethoxymethyl)benzylidene]-1-methyl-piperidin-4-one (BBP), a novel synthetic curcumin analogue has previously been shown to manifest potent immunosuppressive effects on the in vitro phagocytosis process of human neutrophils. Objective: In the present study, BBP was investigated for it's in vivo innate and adaptive immune responses mediated by different humoral and cellular immune factors. Methods: Male Balb/c mice were orally fed with BBP (5, 10 and 20 mg/kg) for a period of 14 days and immunized with sheep red blood cells (sRBC) on day 0 for the determination of adaptive responses. The effects of BBP on phagocytosis process of neutrophils isolated from blood of treated/untreated animals were determined. The ceruloplasmin and lysozyme serum levels and myeloperoxidase (MPO) plasma level were also monitored. The mechanism was further explored by assessing its effects on the proliferation of T and B lymphocytes, T-lymphocytes subsets CD4+ and CD8+ and on the secretion of Th1/Th2 cytokines as well as serum immunoglobulins (IgG, IgM) and delayed type hypersensitivity (DTH) reaction. Results: BBP showed a significant dose-dependent reduction on the migration of neutrophils, Mac-1 expression, phagocytic activity and reactive oxygen species (ROS) production. In comparison to the sensitized control group, a dose-dependent inhibition was observed on lymphocyte proliferation along with the downregulation of effector cells expression and release of cytokines. Moreover, a statistically significant decrease was perceived in serum levels of ceruloplasmin, lysozyme and immunoglobulins and MPO plasma level of BBP-treated mice. 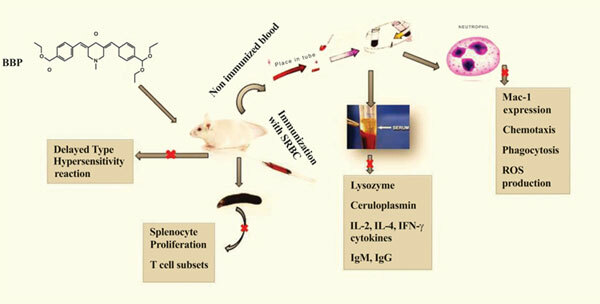 BBP also dose-dependently inhibited sheep red blood cells (sRBC)-induced swelling rate of mice paw in DTH. Conclusion: These findings suggest the potential of BBP as a potent immunosuppressive agent. Curcumin analogue, innate immune response, adaptive immune response, phagocytosis, T-lymphocytes, immunoglobulin.